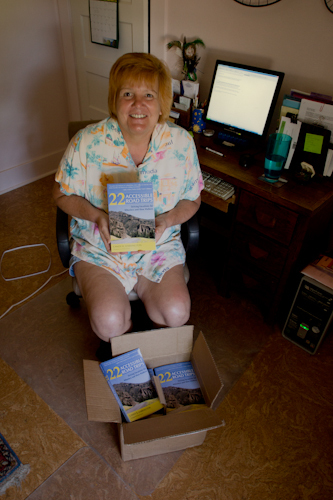 Happy to see my newest title -- 22 Accessible Road Trips; Driving Vacations for Wheelers and Slow Walkers. No matter how many books you write, it’s always a thrill to see a new title in print for the very first time. And that happened once again yesterday when I got a box of 22 Accessible Road Trips; Driving Vacations for Wheelers and Slow Walkers delivered to my front door. And I have to say I’m very happy with the end product. Writing a book is an interesting process, and it involves a lot of collaboration from everyone one from cover designers and copy editors to publicists, editors and of course the author. Fortunately I have a wonderful publisher, so I will say that the whole collaboration comes off without any hitches. And I’m very grateful for that! But even though I have a good idea of what the finished product is going to look like from the final proofs, it’s just not the same as actually seeing in it’s final format. I have to say that I’m really proud of this title, as I feel it pushes the envelope just a bit. It took over 4 years and some 80,000 miles to research, and in the end I feel I put together a very inclusive volume. Despite the title, it’s really a road trip book for everyone, as there are some pretty cool off-the-beaten-track finds included in it. Of course I also included access information for wheelchair-users and slow walkers, because that’s what I do. In the end, it’s just a good road trip book that happens to include access information. And to be honest, that how I think most travel guides should be. Who knows I may be starting a trend here. In any case, I encourage you to give it a read, and then share it with your able-bodied friends. Like I said, it’s really for everyone. This entry was posted in Editorial, Road Trips and tagged barrier-free travel, inclusive, road trips, slow walkers, travel guide, wheelchair by Candy B. Harrington. Bookmark the permalink.